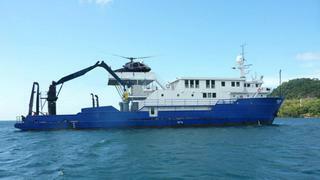 Steve Reoch at All Ocean Yachts sends news that the 53.3m research vessel Proteus has been donated to The International SeaKeepers Society which is dedicated to ocean research and conservation efforts. Additionally, TDI Brooks International will operate Proteus for SeaKeepers along with four other TDI Brooks research vessels. TDI operated the command and control vessel during the on site sampling and remedial work for the BP Gulf Oil spill and are heavily involved in the stewardship of the oceans. SeaKeepers now has access to these five highly specialized science ships to develop the SeaKeepers Discovery Programme and deploy world renowned ocean scientists globally. Proteus was built in 1977 by Rysco Shipyard as an offshore supply vessel and converted in 2005 by Stabbert Maritime to an oceanographic research and explorer yacht. As currently configured she carries up to 19 guests/scientists and 16 crew. Formerly proposed for conversion by designer Sergio Cutolo, she would have had a six stateroom layout with an 85 square metre master suite offering panoramic views and located below an existing ABS classed heli pad. Proteus has had $3.5 million invested in her over the past three years aside from routine maintenance.